Bon Appetit did something else that was quite smart, and that I often do when I’m cooking – something unprecedented in a food magazine: They took a part of the recipe, a sofrito, and rather than cooking up just enough for the recipe, instructed one to make a larger amount, use part of it in the recipe and freeze the rest. Because the sofrito portion of the recipe takes about 30 minutes, it makes a lot of sense to make more and freeze part, and have the rest on hand for another batch or another recipe. Perfect for me, because I make larger amounts of sofrito in batches and portion out for future use, anyway. I estimated, in the recipe, below, on how to make just enough for this recipe. See my Sofrito posting if you’d like to make larger amounts, and use about a cup for this recipe. What is Sofrito, anyway? I describe it as a concentration of summer flavors: Bell Pepper, Tomato, Garlic and Onion, all sautéed to a jammy goodness. Bon Appetit described it as Italian, but many cultures and places have their own variation on Sofrito. There are a zillion uses for Sofrito, but one of my favorites is to use it as a “Spanish Sauce” with scrambled eggs. All that being said, the recipe needed a bit of tweaking – and also a bit of Fabulous Frugalizing, and yes, beans can be fabulous! These ones certainly are! By the way, if you’ve ever heard me say “save the good stuff for drizzling” in referring to Olive Oil? This is a perfect example – if you wish to drizzle a bit over the finished dish, pull it out. Sofrito, onions, peppers, tomatoes cooked to a jammy goodness. 4 to 6 1″ thick slices grilled or toasted bread – home-made Artisan Bread is perfect! Pulse onions in a food processor until finely chopped but not puréed (you should have about a cup). Transfer to a medium bowl. Pulse bell pepper in processor until finely chopped but not puréed (you should have about 1/2 cup); add to bowl and mix well. Heat oil in a large heavy skillet over medium heat. Add onion mixture (it may splatter) and season with salt and pepper. Simmer, stirring often, until vegetables are completely softened, about 30 minutes. Add finely grated garlic and tomato paste and cook, stirring often, until tomato paste begins to turn deep red, about 3 minutes. Remove from skillet, and reserve skillet. Note: may use instead, one cup of Sofrito. Meanwhile, make garlic toasts. Rub 1″ slices of bread with a crushed garlic clove. Sprinkle aout a tablespoon of Parmesan over the top. Preheat broiler and broil several inches away from flame for several minutes until cheese begins to brown. This is best done on a rack so the bottoms of the bread stays completely dry. Heat reserved the sofrito and beans in same skillet over medium-high heat. Cook, stirring often, until heated through, about 1 minute. Stir in 3 cups broth; bring to a boil. Simmer, scraping up browned bits, until liquid is slightly thickened, 3-4 minutes. Add tomatoes, and vinegar and simmer until tomatoes are tender, 3-4 minutes. Stir in 2 tablespoons Parmesan. Season with salt and pepper. If you’d like a thicker sauce, mash a few of the beans and gently stir. Divide bread among shallow bowls. Top with some bean mixture and broth. Garnish with remaining 2 tablespoons Parmesan and parsley. Drizzle with oil, if desired. This dish is marvelous as is – my son added hot sauce, but he does that to almost everything now – guess it’s his new ketchup. 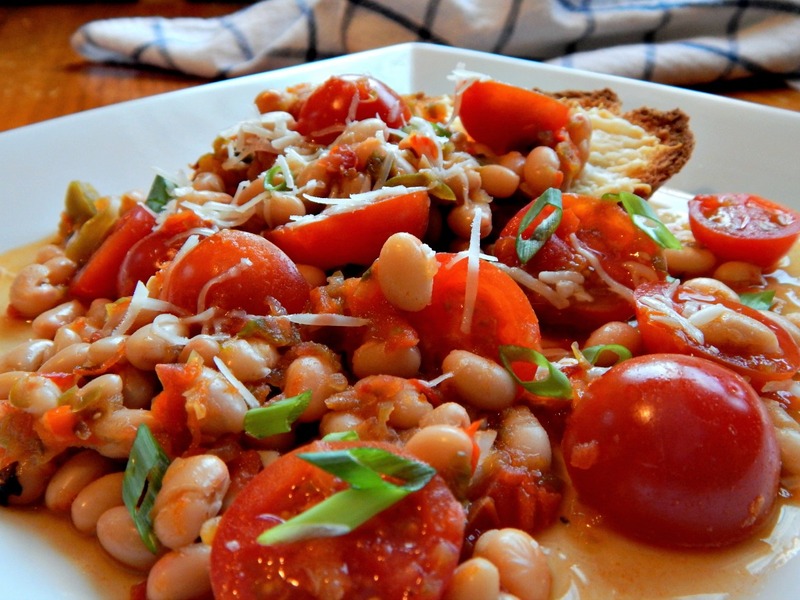 White Bean Ragout over Toasted Parmesan Bread was easy, fresh and substantial – and I have a little extra Sofrito for later! This entry was posted in Click here for Bargain Meals, Click here for Fabulous Food Posts and tagged Bargain Meal of the Week, Beans, Bell Peppers, Bon Appetit, Cherry Tomatoes, Chicken Stock, complete skillet meal, Dried Beans, Italian, Sofrito, Tomatoes, Vegetarian Meal. Bookmark the permalink.